The Brewmaster answers your most burning Famous Canadian Beer Run questions. Nope. Not a beer mile. At the Famous Canadian Beer Run we’re all about savouring the liquid gold. This ain’t no beer mile! All the beer happens after the run. Cross the finish line and we’ll bestow you with your very own stein which gets you two eight-ounce pours (or 4 four-ounce samples) from any of our beer or beverage vendors. Additional tokens are available for purchase online in advance and on-site on run day. Yes, you can meander, walk, skip, jog, run or hammer the course. No, we won’t judge you. Famous Canadian Beer Runners are a pretty chill bunch. Participants run the gamut from turtle-in-peanut-butter pace to out-of-my-way-I’m-training-for-Boston. Wave starts every 30 minutes mean that walkers, runners and everyone in between have ample time to complete the run at their leisure. This event is not timed. In other words, train if you want to. Or not. I don’t run. But I do drink. Can I come? You sure can! You and all your non-running drinking buddies can pick up a Festival Goer pass online for $25. This gives you full access to the Craft Beer & Food Festival after party, your very own beer stein and four beer/beverage tokens (good for 2 x 8 oz. beers or 4 x 4 oz. samples). Can I stash my stuff? You bet! We have a secure bag check for runners and Festival goers. Access your bag throughout the day as needed. We recommend packing sunscreen, shades, a hat, subway tokens or cash for your Uber ride home. Oh, and your phone for all the Insta-worthy shots you’ll be capturing of you and your buddies noshing on sweet eats and tasting the best Ontario craft beers. What’s included with my run registration? 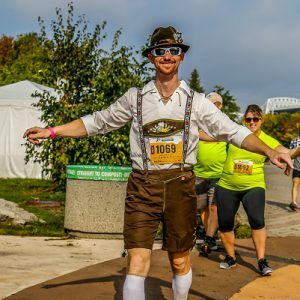 Registered runners get entry into the 5K run, a custom beer stein, soft cotton race t-shirt, 2 beers (or other beverages), race kit filled with awesome sponsor goodies and an epic afterparty with live entertainment.